Today, the Mayor’s Office of Criminal Justice and NYC Health + Hospitals/Correctional Health Services announced the launch of a pilot program that streamlines psychiatric evaluations for defendants in the Queens Criminal Court. The pilot program at Correctional Health Services’ Queens Forensic Psychiatric Evaluation Court Clinic focuses on court-ordered psychiatric evaluations, which largely comprise fitness-to-stand-trial examinations (also known as “730” evaluations). An August 2016 analysis by the Mayor’s office of Criminal Justice found that defendants ordered to take 730 exams spend nearly three times longer in custody than the general population does for similar charges. A significant driver of the differences in length of stay can be attributed to the time it takes to complete the 730 evaluation. The Queens pilot program aims to complete the 730 evaluation process in 14 business days for felonies and 7 business days for misdemeanors. Since the pilot launched in June, 84 streamlined psychiatric evaluations have been completed by Correctional Health Services at the Queens Forensic Psychiatric Evaluation Court Clinic. In 2017, 1,497 730 examinations were completed citywide, including 473 in Queens. Court-ordered 730 evaluations must be completed by at least two qualified psychiatrists or psychologists and submitted to the judge for a determination about competency before defendants can proceed with their case. As the large majority of these evaluations are conducted for individuals who are incarcerated and awaiting trial, delays in the evaluation process can lead to longer lengths of stay in jail. This pilot program was developed in partnership with the Queens District Attorney’s Office, the Legal Aid Society, Queens Legal Associates, the Assigned Counsel Plan, the New York State Office of Court Administration, NYC Health + Hospitals/Bellevue, NYC Health + Hospitals/Elmhurst, and the NYC Department of Correction. In March 2017, Mayor Bill de Blasio announced the plan to close Rikers Island and create a smaller, safer and fairer jail system. The City’s efforts include alternatives to incarceration, enhancing services during detention, and preventing unnecessary incarceration. The Queens pilot program complements the City’s commitment to reduce unnecessary arrests and incarceration, direct criminal justice resources to where they will have the greatest public safety impact, and make a fairer criminal justice system. “The entire Queens Legal Aid Criminal Defense Practice mental health team looks forward to working with the City, doctors, and other clinic stakeholders to reduce the time it takes to conduct psychiatric evaluations for our clients. Our lawyers and social workers recognize the importance of early and timely intervention in evaluating and treating vulnerable people with a mental illness who are charged with crimes. This pilot helps shorten the time clients stay and languish on Rikers and quickens the help and treatment they need and deserve. It’s a win win for all,” said Timothy B. Rountree, Attorney-in-Charge of the Queens Criminal Defense Practice at The Legal Aid Society. “The Urban Justice Center Mental Health Project supports the City’s efforts to reduce the amount of time people with mental health issues spend in jail. People with mental health concerns need a supportive environment that promotes recovery – jail is the opposite. Those whose competency to stand trial is in question are particularly vulnerable to the brutality and trauma of incarceration. We hope that this pilot program is the start of a tremendous effort to transform the way people with mental health issues are treated in New York City,” said Jennifer J. Parish, Director of Criminal Justice Advocacy, Urban Justice Center Mental Health Project. With approximately 43,000 admissions per year and an average daily population of approximately 8,900 in 11 jails citywide, Correctional Health Services operates one of the nation’s largest correctional health care systems. Correctional Health Services delivers health care to patients from pre-arraignment through discharge, providing medical and mental health care, substance use treatment, dental care, social work services, and discharge planning and re-entry services 24 hours a day, 7 days a week. Jail is a critical point of intervention to improve community health, and we recognize both our opportunity and obligation to cushion the impact of incarceration while addressing health needs to better prepare our patients to leave jail and not return. 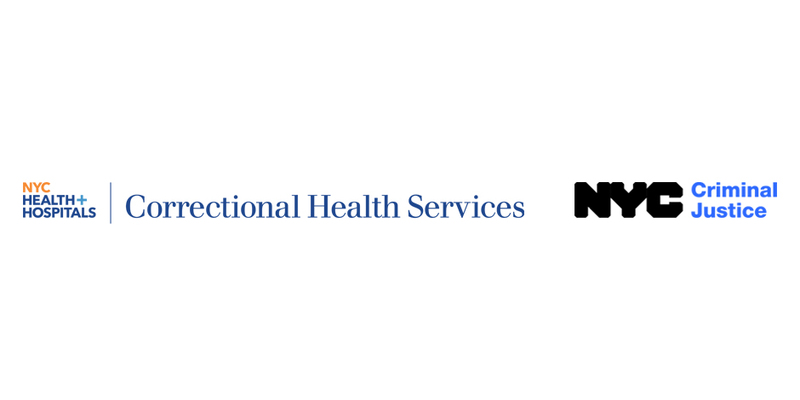 Correctional Health Services is part of NYC Health + Hospitals, the largest public health care system in the nation.